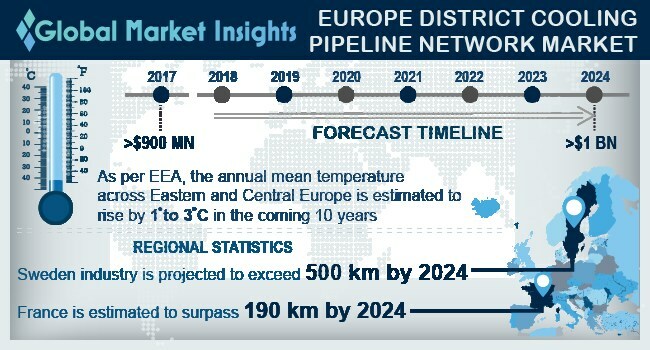 Europe District Cooling Pipeline Network Market size will exceed USD 1 billion by 2024, as reported in the latest study by Global Market Insights, Inc. Growing demand for sustainable cooling solutions coupled with rising concerns pertaining to emissions will foster the Europe district cooling pipeline network market size. Acceleration in demand for space cooling on account of growing average surface temperature across the region including Germany, Italy and Sweden will propel the industry growth. According to EEA, the annual mean temperature across Eastern and Central Europe is projected to rise by 10 to 30 C by the end of decade. Reduced maintenance cost, longer life cycles, reduced heat loss and high efficiency are some of the key features which will drive district cooling pipeline network market. In addition, the increasing use of sustainable insulating material including HDPE, Polyurethane and PUR favored by ongoing government subsidies and incentives will propel the business outlook. France district cooling pipeline network market is set to reach over 190 Km by 2024. Stringent regulatory frameworks toward the adoption of sustainable energy solutions coupled with rapid increase in population will stimulate the industry outlook. Ongoing deployment of smart monitoring systems, efficient piping technology and sustainable insulating material will positively influence the business growth. Growing penetration of small scale cooling systems across the residential establishments coupled with government assisted research and development initiatives will stimulate the demand for 20 – 100 mm diameter pipes. Further, increasing use as a service pipe owing to their ease of transportation and installation will propel district cooling pipeline network market. Polymer pipes is set to witness a sturdy growth on account of their increasing use as a service pipe across the DC grid. Advancement in product technology including thermoplastic technology coupled with ongoing innovations toward development of efficient insulating material will foster district cooling pipeline network market. Ease of transportation, efficient insulating properties, corrosion resistance and low carbon emissions are some of the key features which will propel the product growth. Growing investments toward the deployment of green building structure coupled with stringent building emissions norms will stimulate the commercial district cooling pipeline network market. Further, the increasing investments toward the real estate industry favored by flourishing service sector across the region will foster the industry growth. Government assisted renewable energy targets coupled with strict regulatory framework toward conventional fuels will propel the Italy district cooling pipeline network market. Accelerating temperature across the nation on account of global warming will positively influence the business outlook. In 2016, the average temperature range recorded in Rome was between 80 to 260 C.
Notable players catering across Europe district cooling pipeline network market includes Logstor, Uponor, BRUGG, Perma Pipe, Thermaflex, Aquatherm, Isoplus, Ke Kelit, Huntsman, Cosmoplast, Eval, Future Pipe and CPV Limited. Increasing investments toward better insulating material along with various public and private initiatives toward product adoption has been a key strategic inference for major industry players across the region.